Looks like it needs a friend. Poke me with a fork, I'm done. 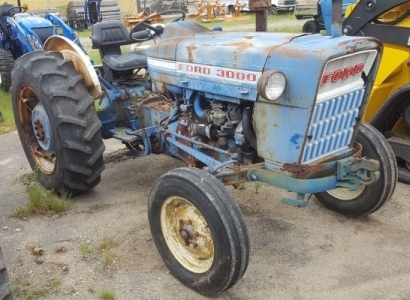 This gem was traded on a newer tractor and was sitting on the dealer's lot looking neglected. They do that on purpose. We go there for one thing, and end up buying something we didn't plan on, and probably don't need. Well, they saw me coming. Not many people are interested in gasoline tractors. The salesman hustled over, and quoted a good price, just not quite good enough to set the hook. The hook was set a couple weeks later when the salesman contacted me with a reduced price. The 3000 is not much bigger than an 8N, and the 3 cylinder gas engine makes almost twice as much horsepower. 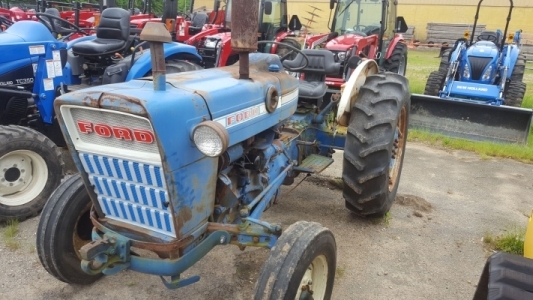 This tractor has 8 forward gears and 2 reverse, double clutch, live hydraulics, live PTO, with a 12 volt negative ground generator system. The padded seat with coil springs, and arm rests, is very comfy, compared to any pan seat. —Bent Nose, Cracked Upper Grill, Needs Paint. —Engine Runs Good, No Smoke, Valves Need Adjusting. 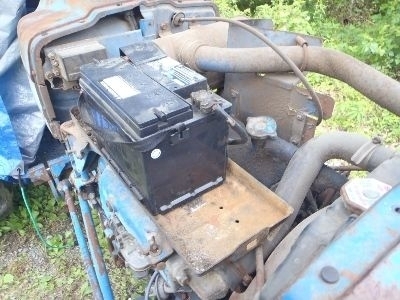 —Engine Wiring Bad, the Rest Looks OK.
—Battery Hold Down Hardware Missing. —Wiring Tube for Rear Lights is Fuel Line Tubing. —Fuel Thingy under the Carb is Loose. —Rear Rims are Pretty Rotten, Tires Good. —Empty Holes in Dash = Missing Switches? —Some Hardware for Power Adjust Rims Missing. The wiring run in steel fuel line would have been ok. It is easy to form and fairly durable. The issue with this job was using a ready-made length, and leaving the two loose flare nuts rattling around on the tubing. It was starting to look like this tractor may be too new for me to enjoy working on it. 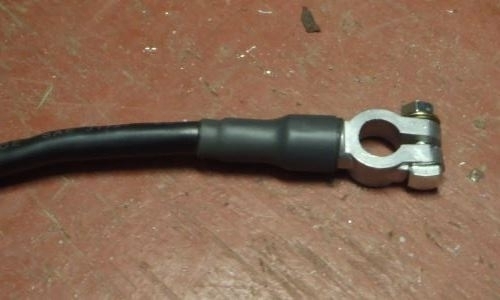 The spark plug wires leave the distributor and disappear. The spark plugs are completely buried under the battery tray. At first glance, this appears to be thoughtless design that has become standard on modern cars. How many things are going to have to come off to get a wrench on the spark plugs? 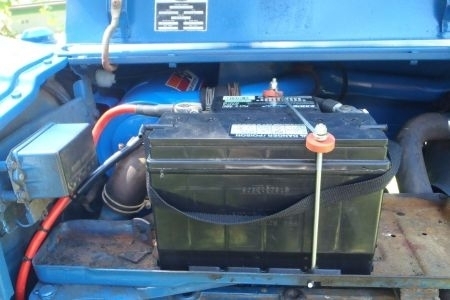 Look again, is that a wingnut next to the battery? What do you think that is for? Curiosity has gotten me in lots of trouble, so I move to the side. The battery might be about to try and squash my foot. Loosen the wing nut until the bolt will slide thru a slot, then the entire battery tray swings out allowing easy access to the engine. Are you kidding me? I swung it back and forth a few times like a kid with a new toy. This is so cool! By modern standards, it's simply incredible they went to such lengths to make routine maintenance easier. Judging by the looks of that valve cover, the valves on this engine have not been adjusted in a very long time. A new valve cover gasket has been ordered. This is the area behind the instrument panel. Looks like some mice made it their home. The proofmeter and gauges were working, but no back-lighting or generator light. Thankfully, there are no chewed wires. 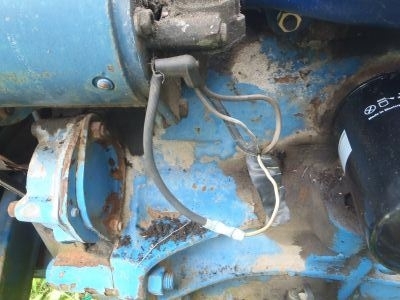 Several terminals were very difficult to remove, and are covered in blue-green corrosion. That rot can eventually spread several inches into a cable like cancer. There are four bulb sockets, two for lighting, and two for idiot lights. All four sockets are in bad shape. 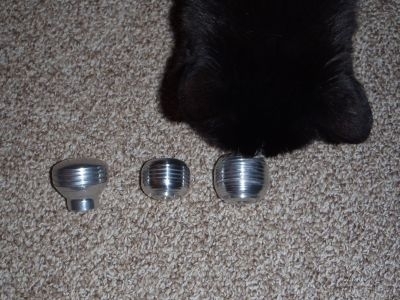 Three bulbs are blown or missing. The wonder was that the oil pressure light was working normally. Snap a few photos before removing wires, bulb sockets, and proof meter cable. 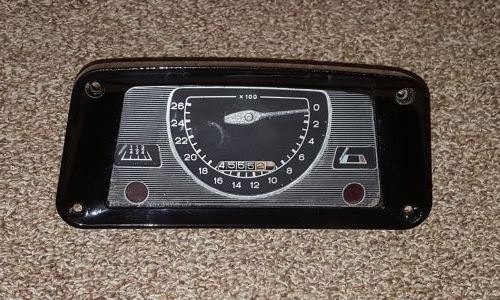 This instrument panel appears to be easy enough to restore, rather than spending a wad of cash to replace it with the slightly different made-in-China knock-off. Darn! The glass broke while attempting to pry the bezel loose from the gaskets. It took 6 tries to cut a new glass from several small pieces carefully stored away for something like this. The pitted and weathered cast frame was carefully sanded, cooked at 350 degrees for 20 minutes, sanded again, degreased with alcohol, then powder-coated gloss black. Powder is cured by cooking at 350 for 20 - 30 minutes. Pre-cooking helps to thoroughly dry the part, reducing blemishes that occur when curing powder paint in the oven. Dry powder also sticks better to warm metal. While the frame was cooking in the oven, the face and gauge pointers needed attention. The face almost got painted a single color. All those fussy black and silver lines seemed impossible to duplicate. It was tedious, but working with a straightedge, X-Acto knife, and scraper, the rust was cleaned out of the lines. A fine tip artist brush was used to fill-in the lines with paint. After that, the wide lines around gauge openings, and pointers were easy. Powder-Coating is great for the impatient! By the time the face was finished, the powder-coated frame was completely cool and ready to be re-assembled. Cutting a new rubber gasket from an old tire tube was tedious, but free. Screws were left a bit loose to leave a small gap that was filled with black RTV sealant. After drying for several hours, the screws were snugged just enough to make sure we have a water-tight seal at that seam (not so much that the RTV is forced completely out). That turned out well for appearance. 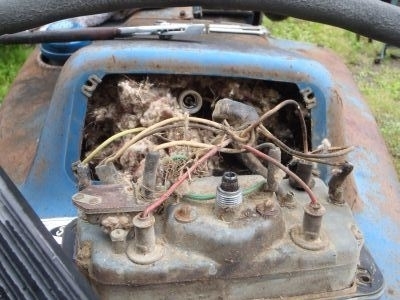 Most of the problems remain on the tractor with the wiring harness. 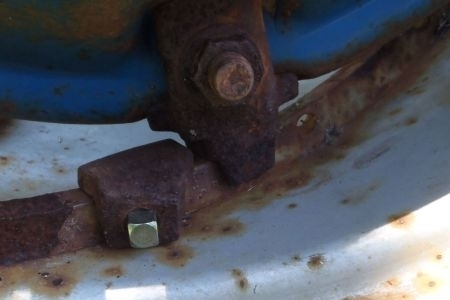 One way to fix blue-green copper corrosion is to wash terminal ends in a solution of vinegar and a couple tablespoons of salt for about two minutes. They should quickly look like new. Immediately after removing from the vinegar they must be thoroughly rinsed in baking soda/water solution to neutralize the mild acid. Rinse completely clean with water, then spray with contact cleaner to dry and protect the terminals. Use small containers for the two solutions. Dip wire ends individually or in groups. Any vinegar splashed or spilled must be neutralized with baking soda and rinsed clean. 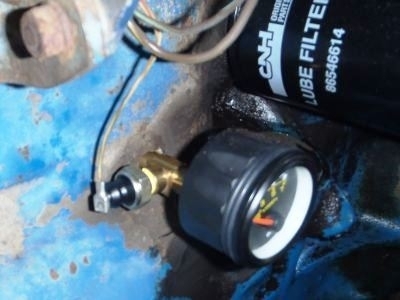 WD40 works as a moisture chaser for terminals and bulb sockets if you don't have the real thing. Don't squirt WD40 in any electronic equipment though. After cleaning LOOK at the wiring harness and terminal ends. The terminals should look like new. The wires should be crimped and soldered to the terminals. Crimp on terminals with the loose insulation sleeves are worse than useless for a tractor. Any exposed copper wire should be covered with marine grade heat shrink. Marine-grade heat shrink has a glue layer on the inside. If no glue appears at the ends when shrunk, it's not marine-grade and it's not weatherproof. What can be seen of the insulated wire should have good color, be flexible, and not appear cracked, burnt, or previously hacked. If any part of the harness does not pass this inspection, it should be replaced. If wires are just dirty, the hand cleaner with lanolin works great. Get some on a rag and pull each wire thru the rag. Clean them completely. I'm not sure what the hand cleaner might do to the insulation over time, but I've cleaned every type of wire and boot this way for many years with no problems. Do not forget to inspect battery cables. This is where nothing less than perfect will do. 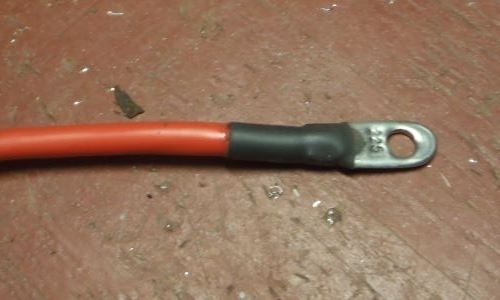 My ground cable turned out to be made up from two pieces with a big lump of tape in the middle and one replacement clamp-on terminal. Absolutely unacceptable. New cables were purchased. How many battery cables have you seen with the insulation pulled out of the terminal exposing the copper wire? My new cables were covered with heat shrink at both ends to prevent that. Is this excessive? Yes it would be, if this was a trailer-queen that will never get wet. For a tractor that will be working in all sorts of weather, weatherproof is absolutely necessary for long-term reliability. My wiring did not completely pass inspection. Most of the harness looks pretty good, but the engine wiring has been hacked in several places. The coil wire is about 3-feet too long with the extra wire just wadded up near the starter relay. Pulling the entire harness off the tractor is much harder on the Ford 3000 than my N-Tractors. Photos were taken to document where wires were routed and connected. Then I discovered the oil light hack and decided not to go any further for now. 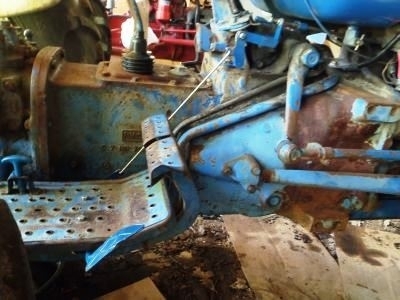 If the entire harness needs to be replaced, more of this tractor is enclosed in sheet metal, with parts of the harness passing through grommets. There are also more wires than on earlier tractors. Rebuilding the original harness in-place might make more sense than replacing the entire harness. The wires under the tape will often be like new. Wires that are in poor shape, or have been hacked can be replaced one at a time. Unraveling all that tape is no fun. Use something like loose pieces of Velcro wrap or loose tie wraps to keep the bundles of wires together as the tape comes off. Don't let the harness fall completely apart. When every wire and terminal looks good, the harness should be covered to protect the wires. I prefer to use the split plastic wire loom that is used on modern cars. It's inexpensive, provides more protection than tape, and is much easier to remove. The Memorial Day holiday weekend weather was originally forecast to be sunny. Then tropical storm Bonnie was going to come up the coast and rain for several days. We ended up having partly cloudy, and warm temps. We have learned not to base any plans on the forecast. The hood side panels are fairly straight, and the paint is in better shape than it appears in these photos. Half of that surface rust just washed off. There was still too much rust not to sand with fine paper, prime, and paint them. These panels are too big for the electrolysis tank, so I used a heat gun and scraper to remove the decals, then sanded them as much as necessary for the new primer to get a good grip. The only cracked/loose paint was where the panels were dented. Chipped paint edges were sanded smooth after the sheet metal was straightened. These are some of the parts removed, so none of the crud on them would end up inside the engine. All parts removed were cleaned, sanded, primed, and painted before being reinstalled. No, I generally don't strip everything to bare metal. My mission is to refresh, not restore. A true restoration project is an incredible amount of work, that makes the tractor so nice, it would be a shame to get it dirty. My methods are ok for working tractors. My tractors have collected a few warts, but they still look good. The radiator cover sheet metal comes off without too much trouble. With the air tube off, remove four bolts, and the entire cover pulls right off. The headlight wires on this one will have to be a complete do-over. Easy access to the radiator hoses was too good to pass up. This is where mission creep starts. Start working on the hood, end up draining the radiator and removing hoses. The lower hose was rubbing the front of the engine. That will quickly wear a hole in a perfectly good hose. It looked like trimming one end might solve the problem. The solution was much simpler, flip the hose end-for-end, and try it the other way. Yep, the hose was on backwards. More Mission Creep: Cleaning hay and dust out of the radiator, then straightening all the bent fins took nearly an hour. The brackets that support the top of the radiator cover are round steel bar. These were pushed back when the nose was dented. 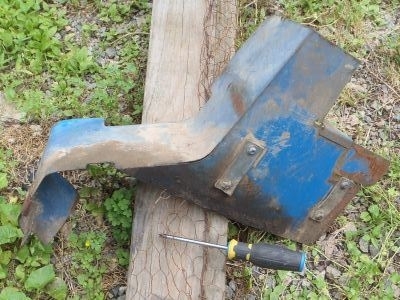 It took a combination of improvised tools to bend the brackets to something that looked like the correct shape. This was done mostly by removing bends that didn't appear to be original. Fortunately, the big dent is right in front of the air tube opening. A long punch can be used thru that hole to bang out the dent. It is tempting to start banging sheet metal where damage is minor, and work back to the worst areas. That is wrong. Sheet metal damage repair should always start at the main point of impact. Visualize what happened, and attempt to reverse the damage exactly as it occurred. As a general rule, never bang on sheet metal without using a dolly on the back. In this case my arms were too short to work both sides by hand. The solution was to lay a large flat shop press arbor plate on the floor. Any heavy flat piece of scrap metal would have worked. Set the damaged nose area on the flat plate. Rock it around to get the part sitting where I would normally hold a dolly. A piece of 1/2" solid bar was then used as a punch and carefully aligned with the worst part of the dent. It only took a few whacks to reverse the badly folded metal. Continue working the worst kinks near the point of impact with the hammer and dolly. When the hammer/punch hits a high spot, the dolly must always be on a low spot or adjacent high spot(s) on the opposite side of the panel. The dolly is used to support the panel, and direct the force of each hammer blow right where it will do the most good. In most cases, the dolly will be held directly opposite the hammer. Some dents are best worked "off dolly". The knowledge of when to work "off dolly" comes with practice, and watching how the metal moves. This is after banging for about an hour. My ears are ringing. Creative use of clamps, pliers, and pop rivets put the seam back together much straighter than the wood screw someone had in it. It is a little early for paint. Block sanding thru the blue color made it easy to see where this panel needed a few more whacks. Perfect is beyond my current skill level. This is why I don't get too fussy about exact colors. Here are some official color codes found searching on the web. Most of the references do not even show the years the color was used. 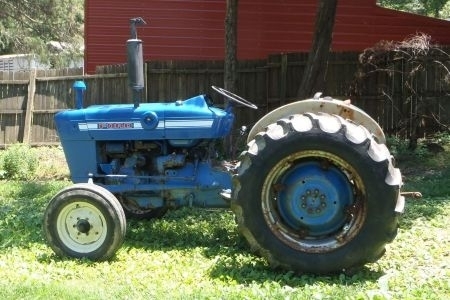 Clues such as "New holland Blue" indicate a color used after the Ford tractor division was sold to New Holland. The WT8027 is too dark and WT8002/8026 are too bright. Based on these swatches the closest color to match my tractor was WT050. Please remember that no color swatch will ever display the same color on different computer screens. 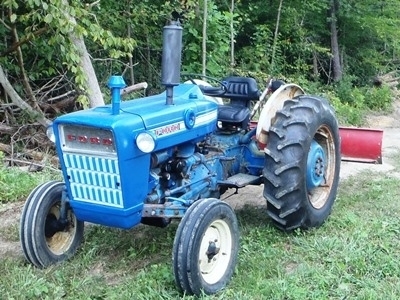 This is intended to show the range of official colors that might be considered "right" for this tractor. At best color swatches on the computer might be similar to real colors. Nothing can replace shooting some paint and looking at it in person. 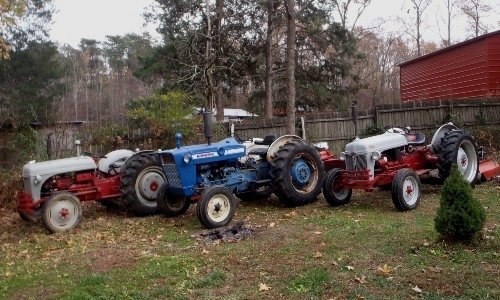 It's your tractor, pick the color you think looks best to you. The chart below was used to see if any standard paint I could find in the store might be close to the color I wanted. 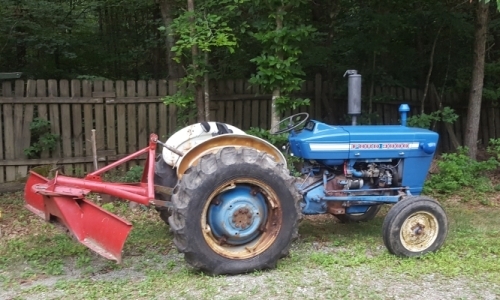 After spraying colors and comparing the results in sunlight, the Krylon and Rust-Oleum Ford Tractor Blue are very close to the same color, but were too dull (grayish) when compared to the blue paint on my tractor. 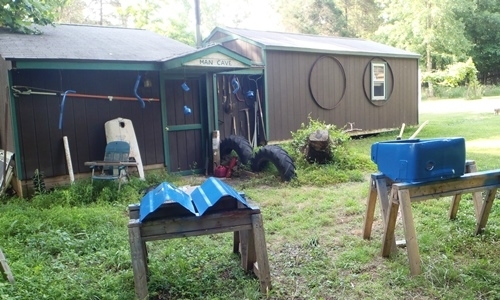 The color that seemed to be the best match was Rustoleum 7727 Royal Blue. This color is just a little lighter, but lighter is the direction I always go when a color will be a little off. The original paint was not as UV resistant as modern paint and quickly faded, so I feel that at some point my choice will be an exact match to the original paint. Still painting outside. Bugs were not too bad this time. Sheet metal looks good. Rims and fenders should be next. Painting of the cast iron parts was on hold. The engine needed work. 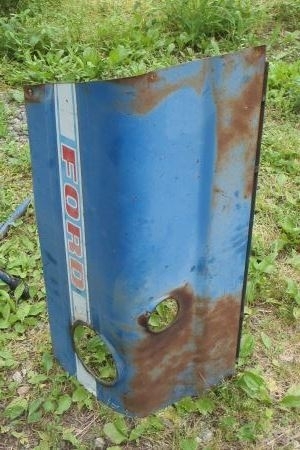 All of the sheetmetal was painted the Rustoleum Royal Blue because it was what I could find easiest. That color looks and photographs a lot lighter outside than it appears in any swatch. Parts to replace the missing locks on the power adjust rims were not hard to find. Unfortunately, the new parts don't fit. More replacement parts from the land of almost fits. The cast lock parts had to be carefully filed until they fit. Then they had to be re-tapped so the pins would thread into them. I suspect this is a case of replacement parts using the nearest metric thread size, rather then the correct inch size. The other hardware on these rims has been sprayed several times with PB Blaster. Hopefully, when I'm ready to install the locks, the other hardware will move. These are some universal battery J-bolts. The piece across the top is a scrap piece of steel rod with a loop bent in each end. The hood turned out ok, for the time spent. The last thing on my list Sunday was to install the connector for a battery maintainer. That should be a simple task. Loosen the battery clamp nuts and put one ring terminal under each nut. Simple, until one end of the positive clamp sheared off as the nut was re-tightened. It never even got snug. This is a brand new cable! I should know better than to buy replacement parts from the local tractor parts store. Removing the broken terminal end was easy enough with a little heat. The original molded lead terminal was replaced with a marine-grade battery terminal. The marine grade terminals come with a solder pellet. Clamp the terminal in a vice, insert pellet, and heat with a torch. When the solder pellet starts to melt, poke the stripped cable end into the solder. Wait a few seconds, remove the torch, and hold the cable in place until the solder hardens. The cable will get too hot to hold if grabbed too close to the end. Cover the cable and terminal connection with a piece of heat shrink. The exhaust manifold was cracked and missing a chunk where the vertical pipe goes in. It might have been repairable. 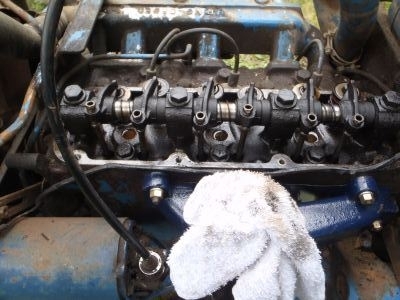 I've fixed worse, but a new manifold for this engine is only about $40. Exhaust manifold bolts are always trouble. 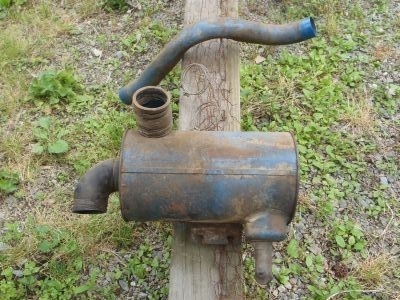 The long one was rusted solid and snapped off about half-way thru the manifold. The manifold would twist far enough to eventually work the gasket out. That created enough clearance to pry the manifold back and forth about a million times to eventually snap that bolt flush with the cylinder head. The broken stub was not frozen in the threads and easily screwed right out. The new manifold was installed with grade 8 studs and brass nuts. The extra long stud was made using a long bolt, cutting the head off, and running a tap on the cut end. 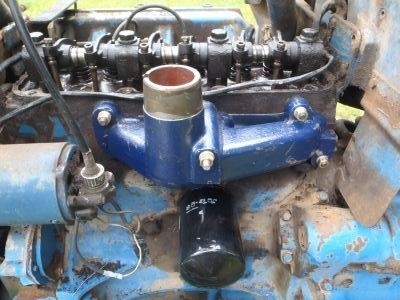 The new manifold is a lot darker blue than any I've seen on a Ford tractor. Not that it mattered. The paint cooked off within minutes of starting the engine. This engine was noisy. All the valves were very loose. The spark plugs were removed to make it easier to turn the engine by hand. According to the manual, four valves are adjusted with No.1 piston at top-dead-center, compression stroke (1&3 Intake 1&2 Exhaust). The remaining two valves are adjusted with the engine rotated one full turn to top-dead-center on the No.1, exhaust stroke (2 Intake, 3 Exhaust). The manual numbers all valves 1 thru 6 from front to back. That seems strange. My preference is to refer to valves by Cylinder No. and Intake or Exhaust. How do we know when the engine is turned to Top Dead Center on No.1 cylinder? Trace the No.1 spark plug wire to the distributor cap. Make a mark on the distributor body where the No.1 distributor post is located. Remove the distributor cap, and turn the engine until the rotor button is pointing at the mark you just made. Turn the crankshaft by hand as necessary to align the timing marks at zero. At this point both valves for No.1 cylinder should be closed. The rocker arms should be loose. Adjust No.1&3 Intake, No.1&2 Exhaust valves. Problem: Adjusting valves on this engine isn't easy. 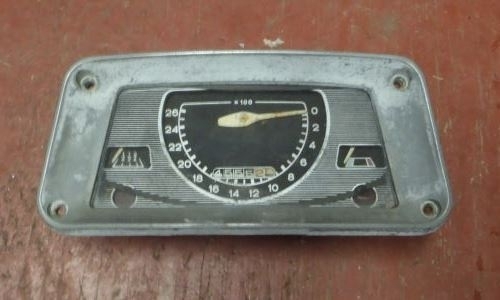 At the toe of the rocker arm the feeler gauge is very loose. Then as the feeler gauge goes in, it suddenly tightens up just about where the back of the valve stem tip should be. There is a slight lip in the racker arm, just beyond the back edge of the contact area. It is difficult to see exactly where the feeler gauge is. A bit of masking tape on the two feeler gauges helped make sure they were going to the right spot on each valve. On 4-stroke engines the distributor turns 1/2 turn for each full turn of the crankshaft. So one full turn of the crankshaft will point the rotor button 1/2 turn away from No.1 cylinder. Do that, then align timing marks at zero again. Now you can adjust No.2 Intake and No.3 Exhaust valves. Done! Three cylinders is SO much easier than a V8! This is some of the hacked engine wiring. The harness looks pretty good, except for the spliced wire. Why was the wire that should go to the oil pressure sender spliced and wrapped around one of the generator terminals with another wire? Maybe they didn't see the terminal on the sender as something electrical. Some people do connect loose wires to the nearest terminal, and assume it will be ok. 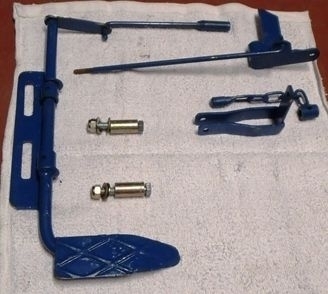 This is a photo of a foot-throttle kit found on ebay. This photo was taken after quite a bit of work was done. These are some of the most poorly finished parts I've ever seen. There was no fit or finish work before the rough parts were shot with a quick coat of blue paint and shipped. There was no primer, no mounting hardware, throttle spring, or instructions. The upper bracket (that should have threaded onto the throttle rod) was threaded wrong (too small). I spent some time at the grinder removing raw edges, rounding corners, then re-drilling, tapping threads, and coming up with proper hardware. Using long bolts with some spacers allow the main bracket to go below the foot-board. I've seen most of these mounted on top of the foot-board. The two-piece adjustable link was probably ok, but there is absolutely no need for this link to be adjustable. A new link was bent from a single length of stainless steel rod. The intent is that the hand throttle should continue to work exactly as it did before. The foot throttle should just add the ability to increase throttle opening from any position of the hand lever. 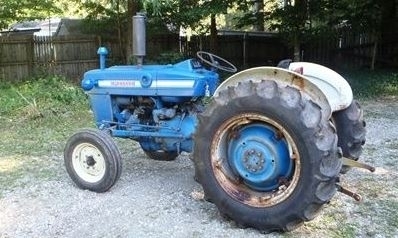 If the hand throttle is left at idle, the tractor should drive like a car. These show the assembled pieces on the tractor. Most of the necessary hardware was missing from this "kit" and it needed a throttle return spring to function correctly. The throttle return spring is currently near the carb, hooked between the choke cable bracket and the throttle bellcrank (right above the choke). Anybody notice those shiny shift knobs? I made one earlier to replace the plastic one on the 8N. That is the one on the Left. The two new ones match the big and little knobs on the 3000. These were turned from solid aluminum, then polished. The next step should have been to test the new foot throttle, but when I cranked the engine up, the (now correctly wired) oil light stayed on. Remember that wire for the oil pressure sending unit that was attached to the generator? 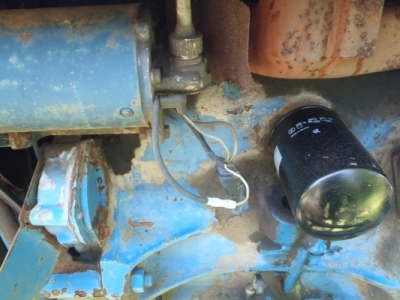 Sometime in the last few weeks that wire and splice was taken out, and terminal was added, and the wire reconnected to the oil pressure sender. Do you suppose the oil light only appeared to be working normally because someone intentionally hot-wired it to the generator! It is hard for a Christian to accept that there are people in this world who will do things like this. Time for some tests. If the engine isn't already terminally damaged, removing the spark plugs, will let it crank without compression. Removing the oil sending unit opens the oil gallery. If there is any oil flow at all, it should squirt out that hole when the engine is cranked. Nothing, not even a dribble. Uh Oh! Now I'm feeling sick. Removed the oil filter and the big cap over the oil pump drive. Crank it again, and the oil pump drive gear is turning, but no oil is coming out the oil filter or sending unit holes. Uh Oh! Drain and remove the oil pan. 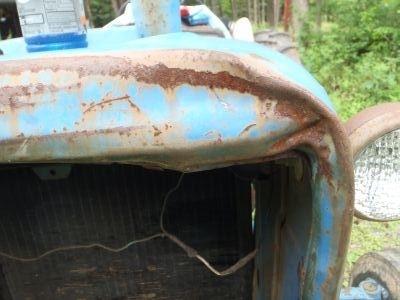 The good news is the oil pan is stamped-steel on this tractor, and not part of the tractor frame. There are twenty two (22) 9/16" bolts around this oil pan. It's 98 degrees in the shade, and 98% humidity. I'm soaking wet, the mosquitoes are biting, and in some strange, twisted way, I'm still having FUN! Even when the pan suddenly comes loose, the unexpected weight tips me forward, and I kiss the engine block. Ok, that wasn't fun, but it was funny. Now that the oil pan is off, it looks like the oil pump screen has been hit with something. Nothing else is loose or broken in there. It's time to go clean out the oil pan. 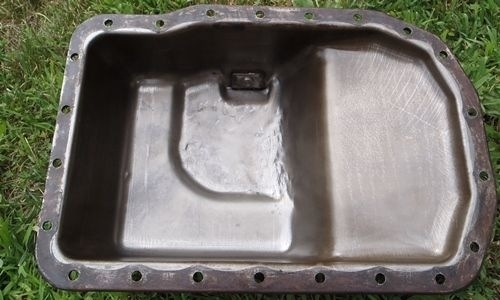 The good news is there are no shiny metal bits in the oil pan, and nothing shiny in the oil. The oil pan does appear to have been dented and hammered-out from the inside. One mystery solved. Once upon a time, something hit the oil pan, and dented it enough to whack the oil pump fairly hard. I've already ordered a new oil pump. Remove the oil pump, and the rest of the story becomes clear. 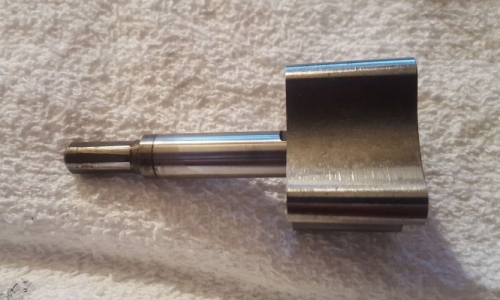 The oil pump drive hex is worn almost completely round. This would explain the lack of oil flow. The pump wasn't turning. The upper pump drive shaft hex was almost as bad. Go back on-line and add the oil pump drive shaft parts to what has already been ordered. It will take a few days for parts to be delivered. Bugs will start nesting in the engine if any holes are left open. To prevent that, two bolts will hold the oil pan in place, screw the oil filter, sending unit, and spark plugs back in to plug those holes. This weekend is no cooler than the last one, but I do have a new can of bug spray. The oil pump did not come with a gasket. I keep an assortment of gasket paper handy, so it was easy enough to bang one out with a ball peen hammer. 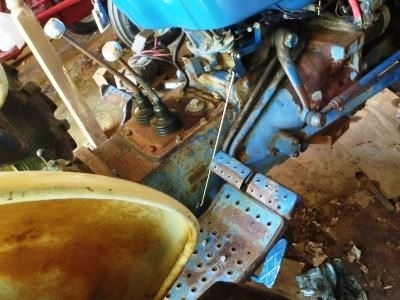 It won't do much good to install a new oil pump if the engine is already damaged. The right way to check the bearing clearances is with Plastigauge. 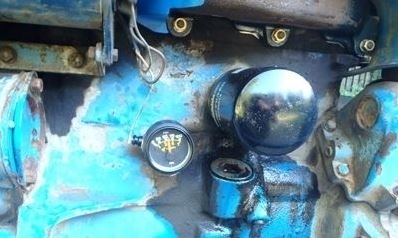 Remove one crank or rod cap and bearing half. Place a strip of Plastigauge across the bearing running surface. Reinstall and torque the bearing cap. Remove the cap and bearing half again and compare the flattened strip of Plastigauge to the chart on the package. The wider it gets, the tighter the bearing clearance is. Tight is good, loose is bad. Clean off the Plastigauge residue, apply assembly lube to the bearing face, reinstall and torque the bolts. Rock the crank to make sure nothing bound up. Now do the next one. This takes time, but it's the only way to do it right. Watch for any bearings that are a different color, or appear to have spun in the caps. Look for grooves, or metal embedded in the bearings. Bearings are soft, so metal in the oil can end up enbedded in the bearings without doing much engine damage. Any bearings that look bad must be replaced with the correct standard or oversize bearings. It is possible to hone light score marks out of one or two rod journals with the crank still in the engine. The main and rod bearings in this engine all checked out within specifications (0.003" to 0.0035") and they all looked very good. Maximum bearing clearance specification for rods and mains in this engine is 0.004". I am very happy to find no wiped bearings. 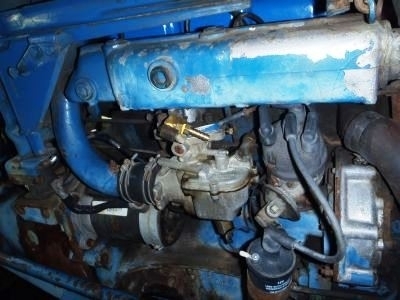 Install the oil pump and intermediate drive shaft with a gasket and two bolts. Install the oil pan, check the drain plug, and fill with oil. Install the upper oil pump drive shaft from the top. Then install the pump drive shaft cap. Rather than simply install the oil pressure sending unit, I wanted to add an oil pressure gauge. A Tee fitting provides a place for the gauge and the sending unit. I left the oil filter off for a quick test. Spark plugs are out. Hold a bucket in front of the oil filter holes and crank the engine. WOW! a solid shot of oil immediately hit the bottom of the bucket! Replace the oil filter, and crank it again. The oil light went off, and the gauge is showing lots of oil pressure. Success! Reinstall the spark plugs, turn on the gas, and ignition. Fire it up! The oil gauge is showing over 70 pounds of pressure! After a short ride, the engine is running in this photo. The close up shows my oil gauge on the engine with 60 PSI. Here's another photo of the oil sending unit and gauge using a Tee fitting. The plan is to eventually relocate the gauge where I can see it from the seat. I'd rather do that without hacking a big hole in the dash I just painted. Until a plan comes together for that, the gauge can stay where it is. The engine still seems a little noisy. Carb needs to be cleaned. I hope it's going to be ok. This is another Tee fitting added to the vacuum port on the intake manifold. The distributor vacuum will be hooked back up. The new manifold vacuum connection is for a PCV hose. I'm doing away with the road draft tube in favor of a closed PCV system with a universal replacement PCV valve and new valve cover vent filter. Hooked up a blade after work today. The engine is running well, and seems to pull good. Unfortunately, it still seems noisy, and burps oil smoke when I put load on it. The PCV system is hooked up. The new vacuum hose can be seen better in this photo. This has likely leaned-out the carb slightly, but not enough to need immediate attention. Put "adjust carb" on my list for next weekend. I've tried running with and without the PCV hooked up, and that does not seem to have any affect on the oil smoke from the exhaust pipe. It's been a few weeks. Headlight wiring has been replaced. A mess of old light switches and wiring under the dash has been removed. The original harness now appears fine. The mess was mostly newer stuff that was added. My new light circuit wires are taped up until a set of tail lights and a work light have been mounted. We graded the driveway last weekend and worked it a little harder this weekend. The engine basically smokes like a train. The main and rod bearings are fine, so there is no need to rebuild the bottom end. A compression check will tell me if the rings are shot. 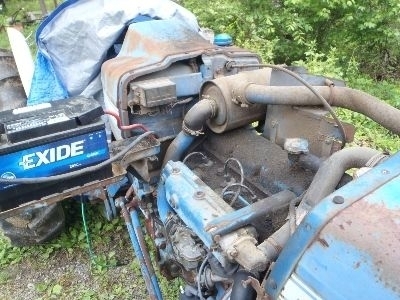 It is hard not to be disgusted, mostly with the person who knew this tractor had a problem, but chose to conceal, rather than fix. Took the 8N out to run the cutter over the trails. That old and familiar feeling came back. These old N-tractors just fire-up and go to work. I'll probably let the 3000 sit for a few weeks, and make some progress on the V8-8N project. OK. I'm a tractor expert now, so reading the manual is for those other people, right? WRONG. 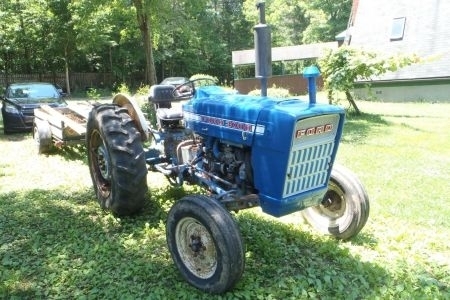 This blue tractor has been cranky since I got it, literally. Getting it started has required more grinding of the starter than it should. Points are right, carb is good, timing, air, battery, etc. I've been thru it all, and fixed anything that seemed a little off. Compression is low, but it still should fire right up. The mystery was solved during one session on the think tank in my "office" (where I do all my best thinking). 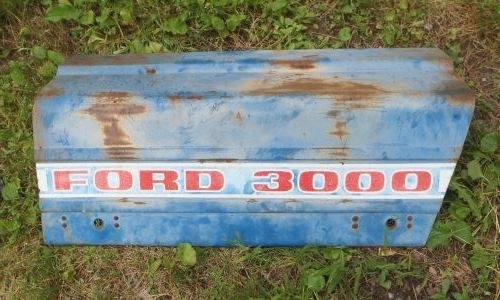 The Ford 3000 Operator's Manual was not my first choice for reading material, but the mission was urgent, and there was no time to look for something else. Typical of most operator's manuals, this one starts out with service, warranty, and of course "Safety Precautions". Nothing unexpected so far. Next section is CONTROLS AND INSTRUMENTS. Ok, maybe this will tell me what the 4th hole in the dash is for. Key Switch, Choke, Lights, and idunno what goes in the other one. 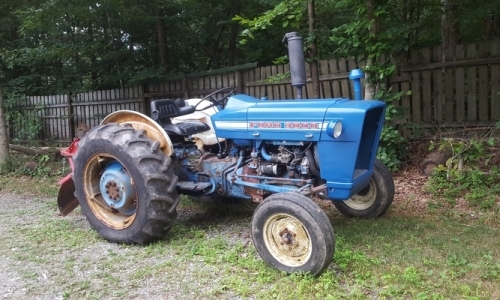 It isn't real clear, but the Ford 3000 tractors cane with several different transmissions, as well as gas or diesel engines. Controls vary with the different options. For my gas engine and manual transmission, the hole under the ignition switch must have been plugged. Key Switch, Choke, and Lights are the only controls indicated. Fine, I can install my ignition ON light in that hole. Reading on, the next section is OPERATION and BREAK IN PROCEDURE. 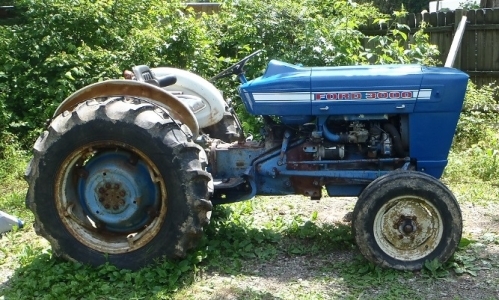 This tractor is way past any break-in period. The next section is STARTING THE ENGINE. The set-up is a little different for each type of transmission. Right after that, under "2. Gasoline Engines:" it says "Move the hand throttle to the closed position." What? Really? That seems strange. Don't think I've ever seen a starting procedure that didn't specify something like 1/4 to 1/2 throttle for starting. Do you think closing the throttle will make any difference? It did. Open Fuel valve, depress clutch pedal, make sure shift levers are in neutral position, CLOSE the throttle, turn the key, and whaddyaknow it started right up! It's rare that this old dog learns a new trick. Mostly I'm too busy forgetting old tricks. 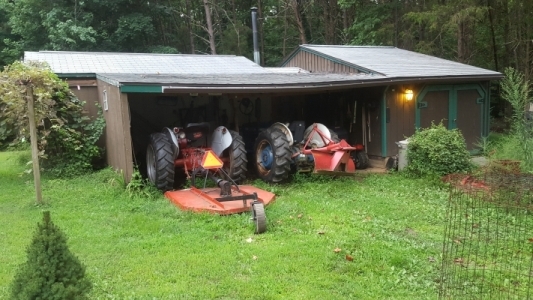 My current fleet of working tractors is the 1946 2N painted redbelly colors, the 1971 Ford 3000, and the 1952 8N. This saga continues with MORE REPAIRS AND UPGRADES.